Product #45587 | SKU EGIMBAL-G1 | 0.0 (no ratings yet) Thanks for your rating! 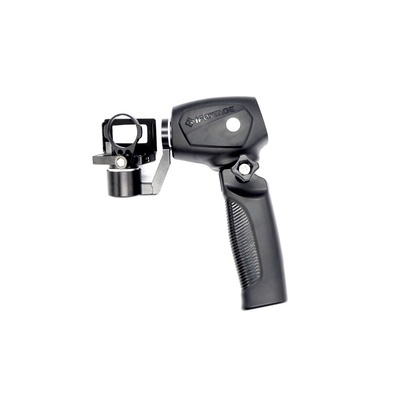 iFootage Hummingbird G1 Electronic Gimbal for GoPro is a handheld brushless gimbal system made of the aluminum alloy and engineering plastic shell, which combines the high performance of the brushless gimbal and the stability technique of the latest gyroscope. Due to the plastic shell and specific design of wiring and selection of components, the Hummingbird is a very lightweight and simple handheld gear. The Hummingbird was designed and intended for easy handheld stabilisation for photographers, videographers and simple day-to-day activities for families in the park, to action sports like mountain biking. The iFootage Hummingbird uses an button to control the tilting angles with its rotational control mode, so users can shoot a full HD view video without moving the stabilizer itself. Take advantage of the possibilies. Remove the handle off the gimbal itself, and users can utilise the thread which will be compatible with many GO PRO accessories like the helmet mount, pole stick mount, bar mount etc. The best way to maximise the usage of this Gimbal is to install it on a hemlet. The viewing angle was also designed for helmet-wear. More details can be caught since this will free the user’s hands. It is a great advantage for this small tool. It is stable and small. Under the assistance of a monopod alike, a more interesting composition can be utilised. And more possibilities provided when users try to shoot some scenes where their hands cannot read, for example, to try to shoot you cat stuck in a tree, or just a flower growing on the side of a cliff. The gimbal uses the same battery as a GoPro camera’s. Therefore it is easy to supply power.